I’ve detailed some very simple RIAA math for opamps in a past post and even did a little PCB board project to test the calculations. The image above is from a Patreon patron who built a battery powered phono from the same batch of PCBs. I’m very happy with the beginner-friendly nature and sound of this 9V-powered opamp phono preamp. The $25 bill of materials is nice, too. But, it doesn’t have a tube. Now that I know the RIAA math and combination of passive and active equalization works, I’ll move on to phase 2. The battery powered two-stage preamp has about 40db of gain (60db if you count what’s needed for the RIAA correction). What if we only asked the opamp to perform the equalization (without the extra gain)? Having an opamp-based RIAA correction module eliminates the pesky RIAA math, but still lets us roll our own for the rest of the circuit. This brings the low frequencies from the phono cartridge up and the high frequency levels down to create a ‘flat’ signal. All that’s left is to make up the 40db or so of gain to get around 1Vrms output. 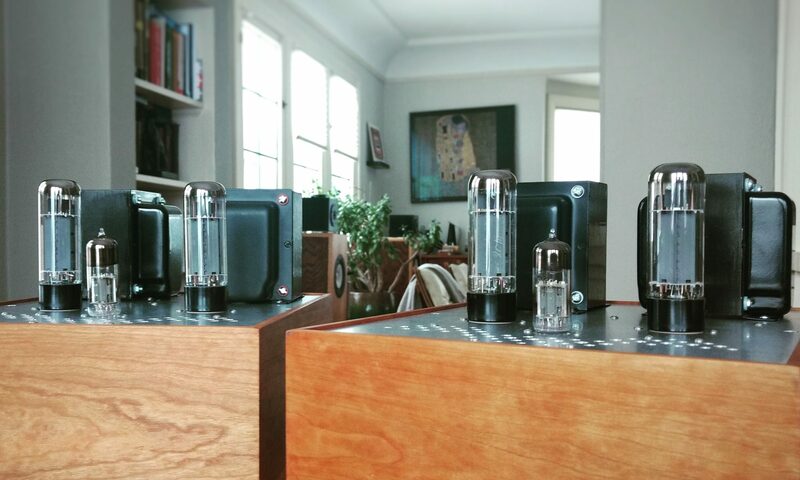 A stage or two of grounded cathode tube amplification is the simple answer. There’s no urgent need for high Mu here, either: just about any tube could work. Note R16 still allows for some gain to be set at the opamp, so even a single tube stage can get a little help. The heater supply is voltage doubled and regulated with a common IC. We can also use a rail-splitter to create a virtual ground and improve the performance of the single-supply opamp circuit. In theory, the above looks like a fun and simple way to build a tube phono stage. The tube type(s) used would be extremely flexible and the RIAA portion adds no real complication to the build. The builder needs only focus on their tube fundamentals. This is on my short list for the next batch of test boards! Enter your email address to follow WTF Amps via email notification. Proud customer of Amplified Parts! I finished restoring that 83 year old radio that I posted 3 weeks ago. Was Given a Stromberg Carlson 32 Amplifier. Was Considering a Bass Head Build. Thoughts, Tips, Literature? Special thanks to all my Patreon supporters, especially the fabulous Matthew Shoup! Interested in a custom project? I sell my projects and build on commission to support my hobby, but it is still a hobby at the end of the day. Lead times and whether or not I’m accepting work depend on real life. If you’re patient though, you won’t find tube gear built with more love or passion. Please email me to see if I’m taking work and/or what projects I may have for sale!